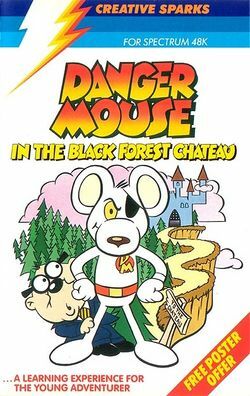 Danger Mouse in the Black Forest Chateau is a text adventure game which was originally released by Creative Sparks for the Sinclair ZX Spectrum, Commodore 64, and MSX in 1984 (and designed by Brian Belson, Edgar Belka and Kevin Buckner); it is the second title in their Danger Mouse series and is again based upon that Cosgrove-Hall (and Thames Television) animated series of the same name. "Colonel K calling Danger Mouse...Ah, there you are! It's an urgent message for you...and Penfold of course. A mysterious Pi-beam is focusing on the world's leading politicians...it's got them into a...sticky mess!" In 2008, this game was remade for today's Windows, Linux, Mac OS X and GP2X operating systems. This page was last edited on 10 March 2015, at 17:30.